Secrétaire à abattant refers to a writing desk characterized by a fall front. 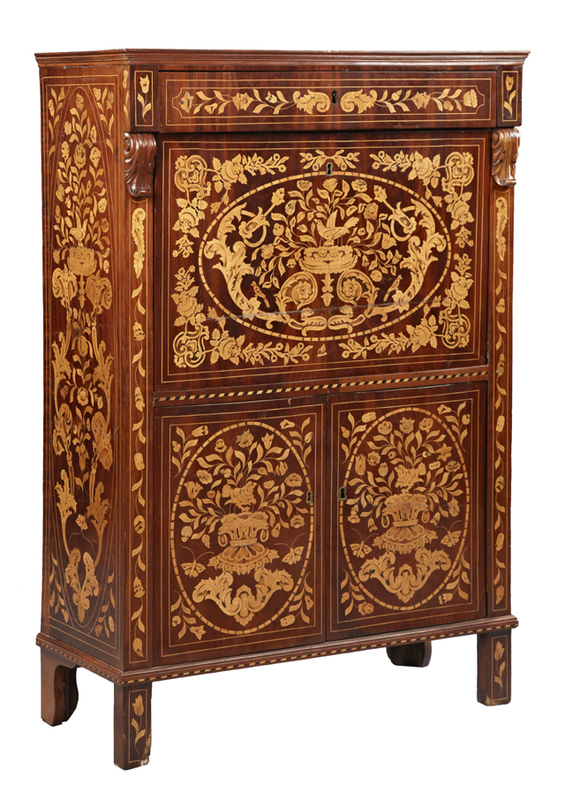 The one shown here is a late 19th century Dutch mahogany marquetry inlaid secrétaire à abattant. It had a pre-sale estimate of $800-$1,200 at Crescent City Auction Gallery’s estates auction held Jan. 14-15, 2017, online and at the firm’s gallery in New Orleans, La. A fall front desk is a cousin of the secretary desk. Both have a main working surface that doubles as a cover to seal up papers and other items located in small shelves or small drawers placed one on top of the other in front of the user. Unlike the secretary desk, a fall front desk's desktop panel is in a perfectly vertical position when closed. In the fall front desk, all working papers, documents and other items have to be stored before the desk is closed. The fall front desk is also called a drop front desk or drop lid desk. Scrutoire and scriptoire are ancient variations. The secrétaire à abattant is a nearly identical form, but is usually in a French style, such as Louis XV or Art Deco. In the 19th century, Shaker communities produced a tall and plain variation which is often known as a "cupboard desk".